Janae Rempel/free pressColton Mercer shakes a Celtic defender during the first half against Hutchinson Trinity on Friday. Marion lost, 26-0. 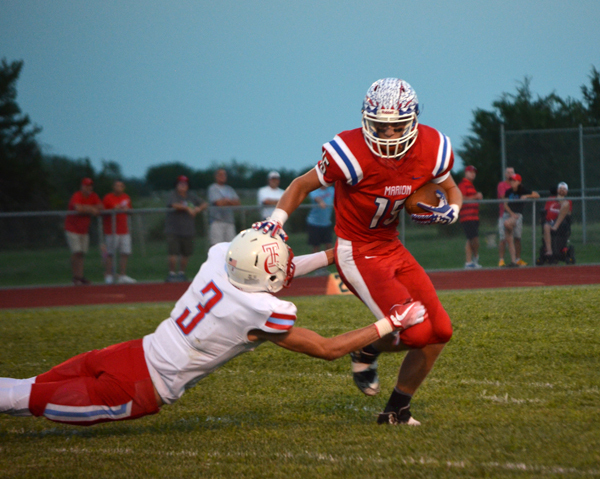 The Marion football team suffered a 26-0 defeat to visiting Hutchinson Trinity on Friday on opening night. Marion fumbled the ball away on the second play of the game, a foreshadowing of what was to come. The Warriors recorded just 132 yards of offense on the night. Trinity, meanwhile, was propelled by the one-two punch of quarterback Kaleb Hammeke and running back Aaron Guerrero, who combined for 285 rushing yards and four touchdowns to lead the Celtics to victory. Hammeke scored Trinity’s first two touchdowns, rushing for scores of 21- and 47-yards, respectively, giving the Celtics a 14-0 lead by the end of the first quarter. Guerrero added a 10-yard score on the second quarter’s first possession, and the Celtics’ 20-0 lead held through halftime. Trinity kept momentum rolling after halftime, with Hammeke rushing for a 25-yard touchdown on the half’s opening possession, giving the Celtics a 26-0 advantage. Neither team scored the duration of the quarter or the game. Eli Hett intercepted a fourth-quarter Celtic pass as Hutchinson Trinity threatened to score, but the Warriors were unable to capitalize in what became a scoreless fourth quarter. Chase Stringer led the Warriors with 100 rushing yards on 16 carries. Coming—Marion (0-1) will host Sterling on Friday at 7 p.m.